Since July 2018, elevated numbers of bottlenose dolphins have died along Collier, Lee, Charlotte, Sarasota, Manatee, Hillsborough and Pinellas counties in southwest Florida. On Aug. 30, the National Oceanic and Atmospheric Administration declared this an unusual mortality event (UME), likely related to the ongoing bloom of Florida red tide (Karenia brevis) algae. Mote Marine Laboratory’s Stranding Investigations Program has been the primary responder to the UME in Sarasota and Manatee counties. Since July 1, Mote and partners have responded to 17 deceased bottlenose dolphins in in this area and worked to conduct thorough necropsies and biological sampling for lab tests. So far, samples from 10 of Mote’s recovered dolphins have been tested for Florida red tide neurotoxins (brevetoxins), and all were positive for brevetoxins. Samples from nine dolphins have been sent and are pending analysis. According to NOAA Fisheries — which coordinates the National Marine Mammal Stranding Network comprising partners including Mote — this UME is challenging but not unprecedented. A 2005-2006 multi-species UME along southwest Florida, caused by exposure to red tide toxins, involved approximately 190 dolphins. Mote Stranding Investigations Program Manager Gretchen Lovewell has been designated by the NOAA Fisheries Southeast Regional Administrator as the On-site Coordinator for the UME to provide on-site leadership and expertise, evaluate the response, coordinate data management, and compile results of data and analyses from partner organizations. NOAA Fisheries leads the UME investigation process, including designating the On-site Coordinator and assembling a team of scientists and stranding network responders (the “Investigative Team”) to evaluate the ongoing response to the UME, review the data collected, and provide guidance for the investigation. Updates on the UME investigation can be found on NOAA’s UME webpage. 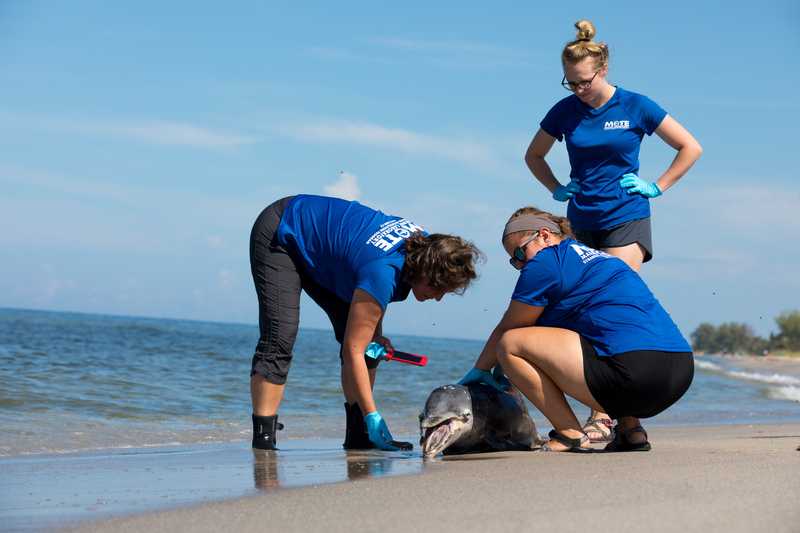 Since July 1, Mote’s Stranding Investigations Program has responded to 17 deceased bottlenose dolphins and 181 stranded sea turtles (9 alive and 172 dead), while helping recover several deceased manatees for the Florida Fish & Wildlife Conservation Commission (FWC), the statewide lead on manatee rescue and recovery. Mote, NOAA Fisheries and state partners at FWC say it is critical to report distressed or deceased marine mammals and sea turtles to trained responders immediately. The stranding network partners work together to address strandings at the local, state and national levels. If you see a distressed or dead sea turtle, manatee, dolphin or whale in Sarasota or Manatee counties, Florida, contact Mote's Stranding Investigations Program, a 24-hour response program, at 941-988-0212. Be ready to provide a thorough description of what the animal looks like, and of any behaviors it is showing. Take photos and video if possible. For distressed or dead manatees, dolphins, whales and sea turtles anywhere else in Florida, call FWC's Wildlife Alert Hotline: 888-404-3922. Anywhere in the southeastern U.S., you can call (877) WHALE-HELP (877-942-5343) to be connected to your local Marine Mammal Stranding Network organization. Mote Marine Laboratory, as a whole, is responding to multiple ecological emergencies: the long-lasting red tide bloom along southwest Florida requiring intensive monitoring, research and outreach; the related spike in wildlife mortality that demands attention at virtually all hours; and a record outbreak of coral disease in the Florida Keys requiring unprecedented, scientific response. While emergency government aid is helping with parts of Mote’s response efforts, it cannot close the gap facing Mote as a nonprofit. Community support can make all the difference in helping Mote address these emergencies issues. Visit this page to support these critical efforts.